DISC offers rock-solid proof of our years of superb results in the form of detailed ROI reports delivered to actual clients. We have approval from some clients to share reports with non-competing organizations. Others may be available upon request. Below are a few client stories. But really, even a poor SEM firm will have some good results–the real proof comes from you selecting clients from our client list, and we email you the results. In January of 2014, this long-established non-profit chose DISC to help with SEO and conversion rate optimization (CRO). We found that a recent temporary redesign cost them 80% or their organic search engine traffic, and DISC’s work restored all of it within a few months—see January to April 2014 below. Since that restoration, DISC’s continuous SEO work has raised their website to #1 in Google for highly competitive phrases, like “macular degeneration”—see the incognito results from September 2016 below. The dip in June 2015 was due to a huge redesign not done by DISC; such temporary declines are avoidable in part due to Google’s new ways of handling 301 redirects. Click here to see September 2016 Google results for the highly competitive phrase “macular degeneration”–or search that phrase in Google now. In August 2015, DISC took over management of a Google Grant Adwords campaign that was failing to us even 15% of the free $10,000 in monthly clicks Google grants qualified non-profits. The chart below shows that even with a low click cost cap of $2 (per the Grant program), we tuned the campaign to use nearly all of the 10G on relevant, competitive phrases. Conversion rates are 50% higher than the average of other channels. Jerry’s was a client from 2003 to mid 2009, when Jerry’s hired a full time search marketing staff –which DISC long recommended they do. Our last comprehensive year-end report was in early 2008, and we can show you plenty of subsequent and earlier monthly reports upon your request. 2007 website sales rose 30%, and that’s on top of DISC’s four years of excellent search marketing results. Each year saw dramatic improvements. For example, in our first 2003-4 year, ROI (all search marketing costs subtracted from gross profit) = $1,331,000. Click costs plus DISC’s labor were $155,000, with PPC sales at $1,169,000, for a gross profit of about $570,000. Trusted feed/shopping comparison site sales increased every month in 2007 over 2006, for a total increase of about $350,000 over DISC’s superb work the previous year. These 2007 sales were $1,513,000, with total costs at $135,000, for a gross profit of about $621,000. See also: DISC’s Case Study of Jerry’s Artarama featured in the The Complete Guide to Google Advertising. The stats below show SEO ROI for a client that came to us with a tons of traffic, a 12 year history, PageRank of 6, and thousands of incoming links, many of them very strong. Our SEO went live on 4/25/10, with additions afterwards. 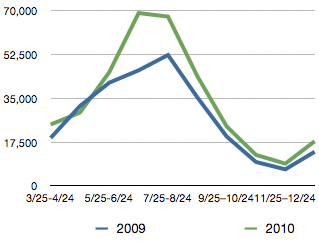 In the year-over-year analysis, 2010 surpassed 2009 numbers starting in May (after new SEO and other work went live). This chart shows ROI for the first 2 years based on average PPC costs. ROI for the first year is over $61,000. In July 1999, GBI Marketing, a fundraising marketing firm serving major manufacturers, approached DISC with a web site with mediocre design and very little search engine position. DISC redesigned the site and did complete SEO on 10 pages, for about $17,000. Within one year, the enormous increases in site traffic and customers required GBI to buy a new warehouse. 70% of new business came from DISC’s SEO. Especially noteworthy is that no tweaking of the original SEO was done after 1999 until Yankee Candle bought GBI in the mid-2000s and absorbed the websites, yet the SEO results remained improved over that time. In September of 2004, DISC’s SEO quadrupled search engine referrals. Please ask us for reports and references.